Superstar Salman Khan took time off from his busy schedule to attend the wedding of Telegu star Venkatesh Daggubati’s daughter in Jaipur. Pictures from the wedding have been viral on the social network since then. 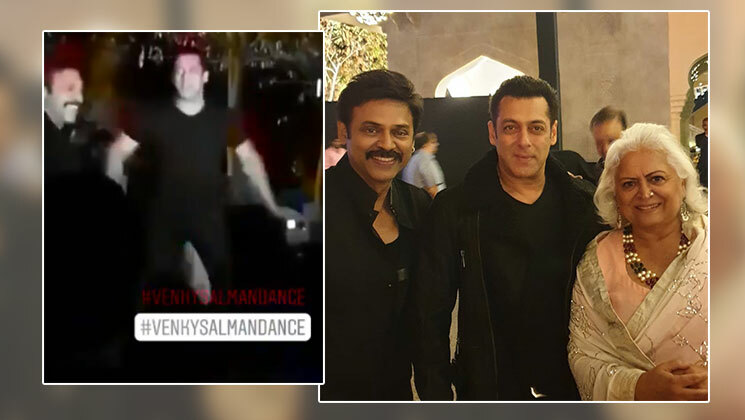 Now a new video of the Dabangg Khan dancing to the tunes of ‘Jumme Ki Raat’ from ‘Kick‘ with the father of the bride actor Venkatesh is viral. Salman Khan was recently in Dubai for his ‘Da-Bangg Tour’ with Sonakshi Sinha, Katrina Kaif. Jacqueline Fernandez and others, but due to bad weather it had to be canceled. The ‘Bajrangi Bhaijaan‘ had taken to his Instagram handle to apologize to his fans. On the work front, Salman Khan is currently gearing for the release of ‘Bharat’. The Ali Abbas Zafar directorial also features Katrina Kaif, Sunil Grover, Jackie Shroff, Disha Patani and Tabu. The movie is a remake of a Korean film ‘Ode To My Father’ and will be tracing the journey of Salman’s character over a period of over 60 years. The trailer of the film will be attached with the most awaited Hollywood film of the year, ‘Avengers: Endgame’. The much-awaited film will be released on Eid this year. Salman has also joined hand with his ‘Dil De Chuke Sanam’ director Sanjay Leela Bhansali for his next film ‘Inshallah’. The Dabangg Khan will be sharing screen space with Alia Bhatt in it. Next on the pipeline is ‘Dabangg 3’.